French President Emmanuel Macron and his wife Brigitte Macron arrive for their state visit to Washington and meetings with U.S. President Donald Trump after landing at Joint Base Andrews in Maryland, April 23, 2018. French President Emmanuel Macron enjoyed the first day of his three-day state visit to Washington Monday with dinner at Mount Vernon and meeting fellow visitors and tourists at the Lincoln Memorial. But several issues of global importance are in the air when he and President Donald Trump get down to business in the Oval Office. Trump takes great pride in his friendship with Macron, which is one of the reasons he invited the French president to be his guest for the first state visit of a foreign leader in his administration. "This visit is very important in our current context, with so many uncertainties, troubles, and at times, threats," Macron said upon arriving in Washington. Macron will likely use part of his White House talks to try and persuade Trump not to pull out of the six-nation nuclear deal with Iran. Trump has constantly called it a bad agreement. He faces a May 12 deadline to again waive economic sanctions against Iran as part of the agreement. Iran would regard the reimposition of sanctions as killing the deal and threatens to restart its nuclear program. Macron has said he knows the deal with Iran is not perfect but said there is no "Plan B." Trump also has until May 1 to waive tariffs on European steel and aluminum imports or face a possible trade war. The French president will also likely talk to Trump about what Macron said is the importance of U.S. forces remaining in Syria. Trump has talked about withdrawing Americans from northern Syria. Macron said that would increase the risk of giving up Syria to the Assad regime and Iran. FILE - A World War I trench and artillery piece remain in the dark interior of Belleau Wood in France, June 5, 1948. The Battle of Belleau Wood, between U.S. Marines and German troops, was fought here between June 1-26, 1918. Shortly after his arrival in Washington Monday, Macron and his wife, Brigitte, along with Trump and first lady Melania Trump, planted a young tree on the South Lawn of the White House. It came from the Belleau Wood, where more than 9,000 American Marines died in a 1918 World War I battle on French soil. The Macrons and Trumps also took a helicopter tour of famous Washington tourist attractions before touching down at Mt. Vernon, the 18th century estate of America's first president, George Washington. 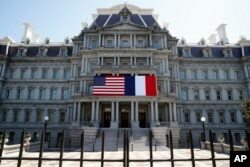 The U.S. and French flags are displayed on the Eisenhower Executive Office Building, April 20, 2018, in Washington. Trump will officially welcome Macron with a full military ceremony at the White House Tuesday, including nearly 500 U.S. troops from all five branches of its armed forces, and will host a state dinner with entertainment by the Washington National Opera company. Macron will address Congress in English Wednesday, before heading back to Paris. 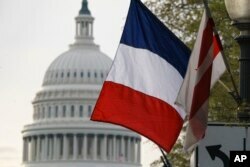 The French flag, along with the American flag and the flag of the District of Columbia, is seen with the U.S. Capitol in the distance in advance of French President Emmanuel Macron's Washington arrival for a state visit, April 23, 2018.